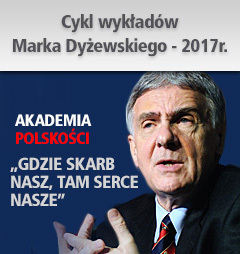 TYLKO U NAS PEŁNY TEKST MATERIAŁÓW INFORMACYJNYCH, JAKIE DOTARŁY DO UCZESTNIKÓW SZCZYTU NATO! 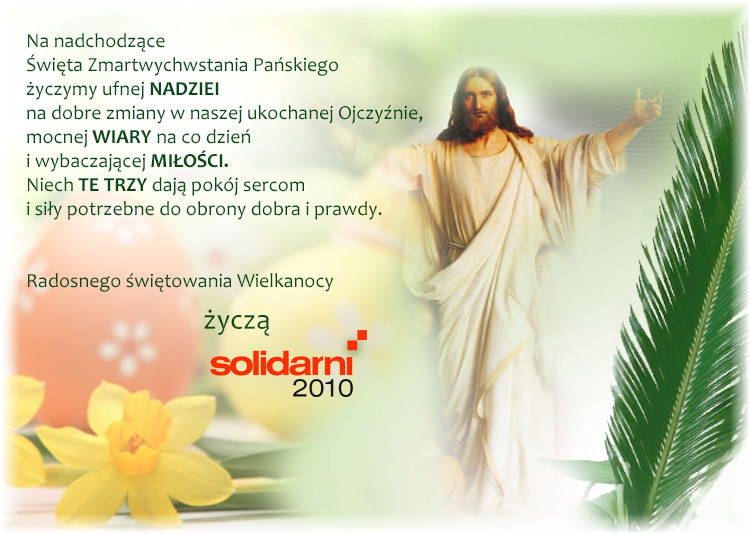 W dniu dzisiejszym na terenie szczytu NATO dostępnym dla prasy kolportowane są przez Prezes Ewę Stankiewicz oraz grupę oddelegowaną z ramienia Stowarzyszenia Solidarni2010 materiały informacyjne o Katastrofie Smoleńskiej. 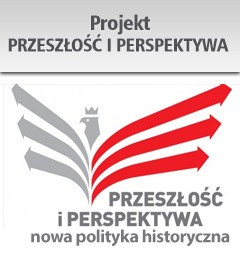 Wszyscy uczestniczący w akcji ulotkowej posiadają odnośne akredytacje dziennikarskie uprawniające do przebywania na terenie centrum prasowego. Rozdano kilkadziesiąt pakietów informacyjnych i przeprowadzono wiele rozmów z zainteresowanymi kwestią Katastrofy Smoleńskiej 10.04.2010r. Publikujemy PEŁNY tekst materiałów informacyjnych, sygnowanych przez Stow. 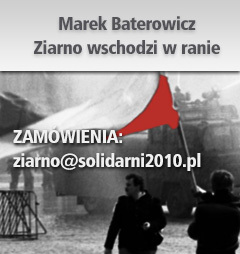 Solidarni2010, autorstwa eksperta komisji badania przyczyn katastrofy smoleńskiej Glenna Jorgensena, jakie rozdawane są wśród uczestników szczytu NATO oraz wśród akredytowanych dziennikarzy. Materiał zawarty w obszernym naukowym opracowaniu był wcześniej prezentowany publicznie podczas Konferencji Smoleńskich organizowanych czterokrotnie przez niezależnych polskich i zagranicznych naukowców. EVIDENCE DISPROVES PUTIN’S INVESTIGATION OF THE SMOLENSK CRASH. 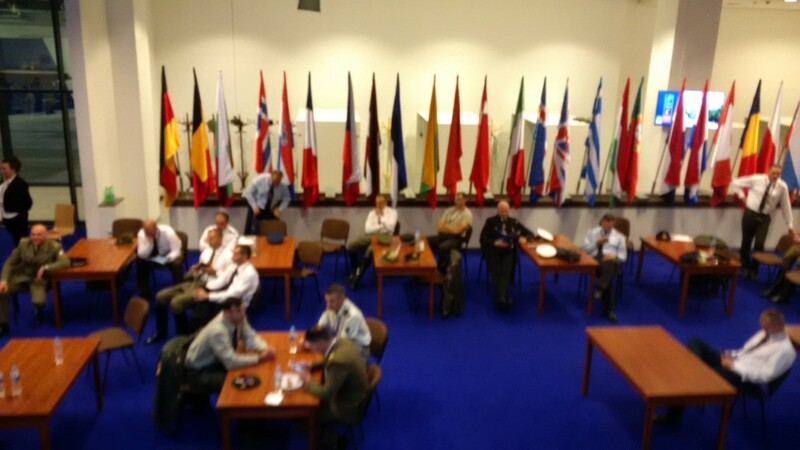 THE PRESIDENT OF A NATO COUNTRY AND 10 NATO GENERALS WERE KILLED. On the 10th of April 2010 a TU-154M aircraft from the Polish Air Force crashed in the city of Smolensk, Russia, killing all 96 people on board on their journey to Katyn. 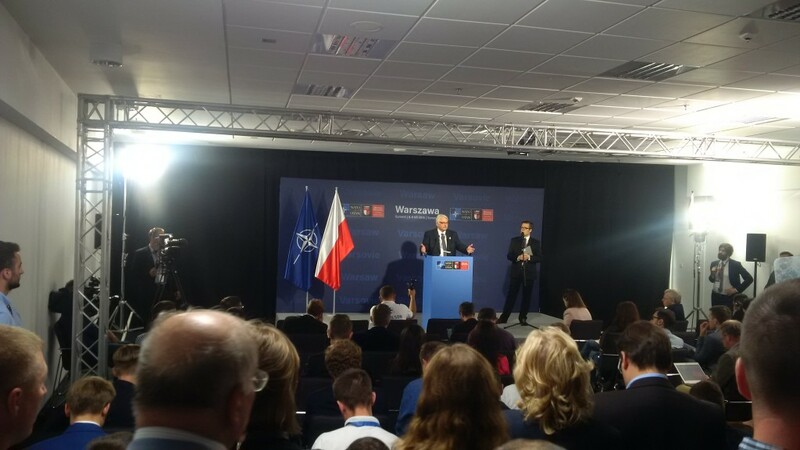 These included President of Poland Lech Kaczyński and his wife Maria, former President of Poland in exile Ryszard Kaczorowski, the founder of the Solidarity movement Anna Walentynowicz, the chief of the Polish General Staff and 9 other leading Polish NATO Generals. 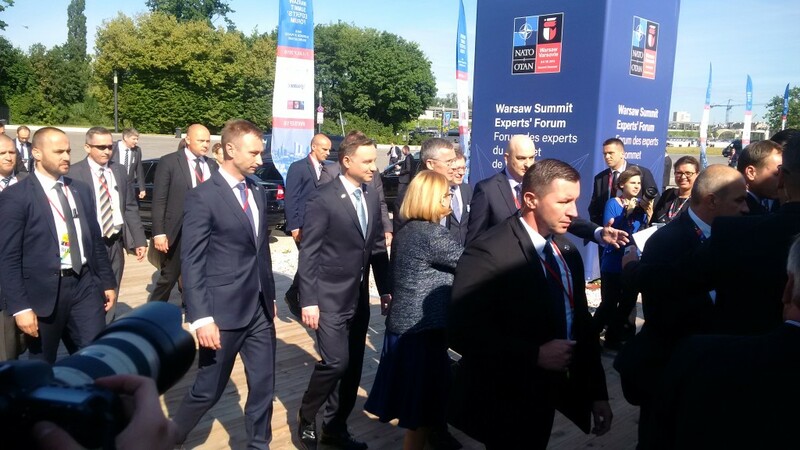 The Polish President and the vast majority of the passengers on board were known as patriots of Poland and many were in opposition to the Polish government lead by Prime Minister Donald Tusk from the P.O. party. 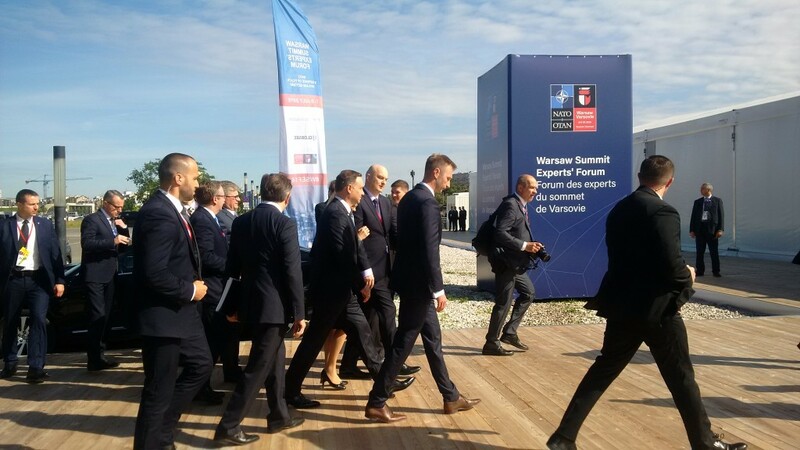 Plan to visit Katyn was changed by Putin and Donald Tusk. Originally the visit to Katyn was planned as a common memorial of participants from the entire Polish political spectrum including the Polish president and Polish prime minister from their different respective opposite political platforms. 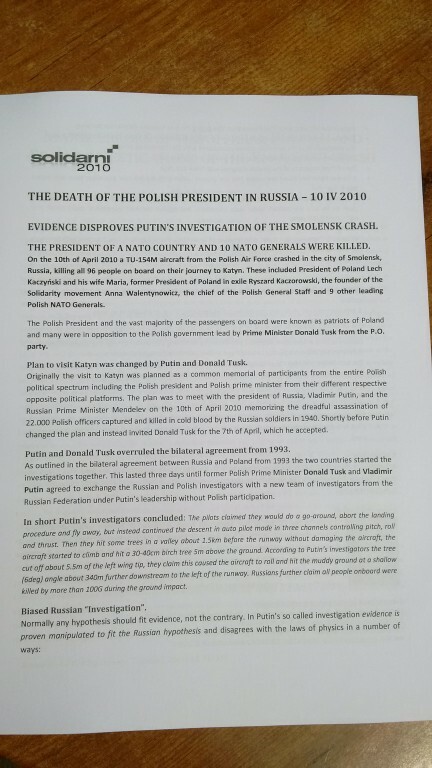 The plan was to meet with the president of Russia, Vladimir Putin, and the Russian Prime Minister Mendelev on the 10th of April 2010 memorizing the dreadful assassination of 22.000 Polish officers captured and killed in cold blood by the Russian soldiers in 1940. Shortly before Putin changed the plan and instead invited Donald Tusk for the 7th of April, which he accepted. Putin and Donald Tusk overruled the bilateral agreement from 1993. As outlined in the bilateral agreement between Russia and Poland from 1993 the two countries started the investigations together. This lasted three days until former Polish Prime Minister Donald Tusk and Vladimir Putin agreed to exchange the Russian and Polish investigators with a new team of investigators from the Russian Federation under Putin’s leadership without Polish participation. In short Putin’s investigators concluded: The pilots claimed they would do a go-around, abort the landing procedure and fly away, but instead continued the descent in auto pilot mode in three channels controlling pitch, roll and thrust. Then they hit some trees in a valley about 1.5km before the runway without damaging the aircraft, the aircraft started to climb and hit a 30-40cm birch tree 5m above the ground. According to Putin’s investigators the tree cut off about 5.5m of the left wing tip, they claim this caused the aircraft to roll and hit the muddy ground at a shallow (6deg) angle about 340m further downstream to the left of the runway. Russians further claim all people onboard were killed by more than 100G during the ground impact.  Parts of the left wing were found more than 30m before the tree Russians claimed cut the wing.  The tree is proven much too weak to cut the wing. This is documented in a peer reviewed scientific paper.  The recorded roll of the aircraft is proven inconsistent with the claimed loss of wing. 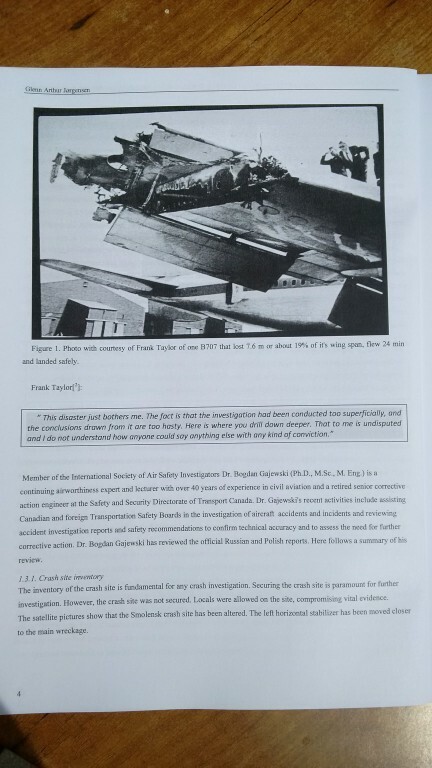  The aircraft would not roll over and crash if only 5.5m wing was lost. 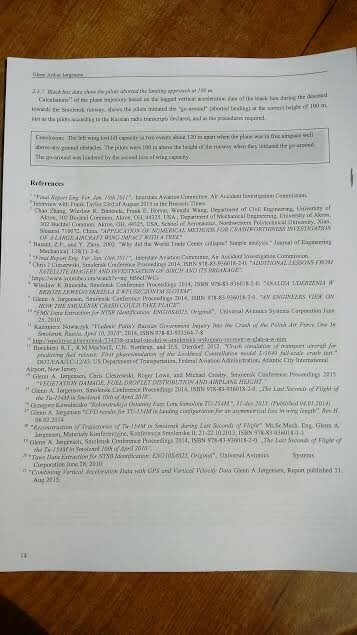  The claimed trajectory of the aircraft disagrees with black box data. third law of action and reaction.  A big number of parts of the aircraft were found into the ground even 100m before the crash site. associated with extreme wind velocities as by blasts.  6 exhumations have years later proven the coffins contained the wrong bodies in all cases.  Severe and significant errors were present in the Russian autopsy reports. they returned, and by neglecting to obtain and include relevant data made available to them.  The area before and after the birch tree show no impact from a jet blast. tail would dig into the ground.  Direction of wing cut was not in the direction of the flight.  The front edge of the wing in the line of cut was completely undamaged.  The fuselage shows signs of a high internal pressure opening it prior to it hitting the ground. 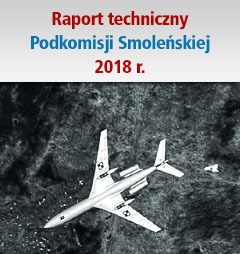 A significant amount of heavy evidence disagree with the Russian investigation of the Smolensk Crash on the 10 th of April 2010 lead by Vladimir Putin, disproving the Russian hypothesis of pilot error and controlled flight into terrain. Danish citizen Glenn Arthur Jørgensen holds a Master of Science (MSc) within Fluid Dynamics from the Technical University of Denmark and is presently taking another MSc within Crash Investigation from Cranfield University in UK. He has over the past 4 years spent more than 3000 hours investigating the Smolensk Crash on a voluntary and unpaid basis. 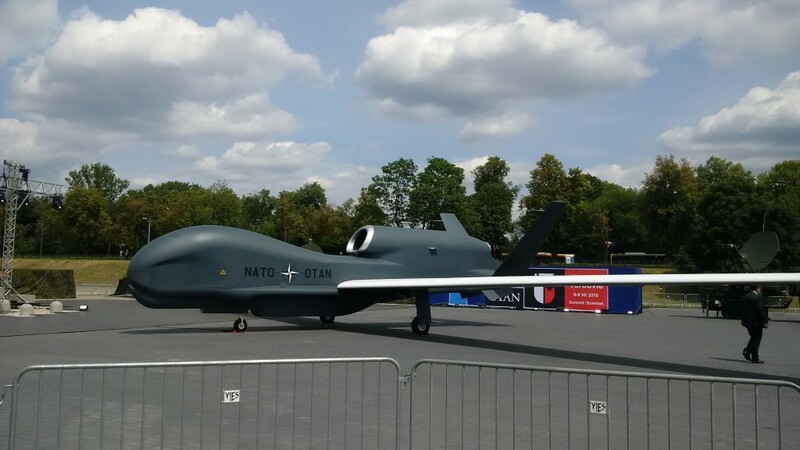 He is now working together with the newly created Polish Crash Investigation team under the current Polish Minister of Defense Antoni Macierewicz. for Dr. B. Gajewski's and Ms. Sc. G. Jørgensen's presentations in the European Parliament March 2015. Visit http://www.smolenskcrashnews.com/ for more information.